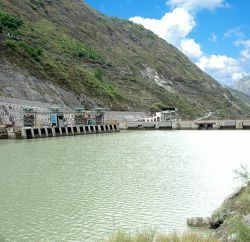 For the financial year 2014-15 SJVN Limited plans energy generation of 7920 million units (under Excellent parameters) with an expected revenue realization of ` 1820 crore and gross operating margin of ` 818 crore from its 1500 MW Nathpa Jhakri Hydro Power Station, 412 MW Rampur Hydro Power Station (7850 MU) in Himachal Pradesh, as well as from its 47.6 MW Khirvire Wind Power Project (70 MU), in Maharashtra. The MoU provides for commissioning of all the six units of 412 MW Rampur Hydro Power Station by Sept. 15, 2014. The MoU also includes targets for implementation of 1320 MW Buxar Thermal Power Plant in Bihar. 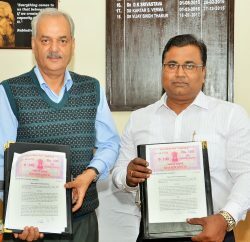 A Memorandum of Understanding (MoU) to this effect was signed between P.K. Sinha, Secretary (Power) Govt. of India and R.P. Singh, CMD, SJVN Ltd. at New Delhi on 24th March, 2013 in the presence of Devendra Chaudhary, Addl. Secretary, Pradeep Kumar, Joint Secretary (Finance), Mukesh Jain, Joint Secretary (Hydro) and Rajiv Gupta, Director (Hydro) of the Ministry of Power. On this occasion R.N. Misra, Director (Civil), A.S. Bindra, Director (Finance), N.L. Sharma, Director (Personnel) and R.K. Bansal, Director (Electrical) were also present. 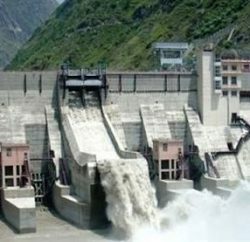 In the growth parameters SJVN will work towards formation of joint venture Companies for implementation of the 600 MW Kholongchu Hydro Electric Project in Bhutan as well as 1000 MW Ultra Solar Power Project in Rajasthan besides signing of MoU with the Govt. of Arunachal Pradesh for execution of 80 MW Doimukh HEP. The MoU targets for providing training in Skill Development to 600 youths, farmers, womens and disabled persons to promote employability and self employment through training courses in I.T.I.s and other accredited agencies. For providing Health Services to old age, disabled and women at their door steps, SJVN will organize four (4) additional Mobile Medical Units, and 40 Specialised Health Camps. SJVN is already operating eight (8) Mobile Medical Units in the vicinity of its projects in Himachal Pradesh and Uttarakhand. During the year SJVN will also ensure skill development of at least 90% of its employees through various management/technical programmes viz. competency & leadership development, Risk Management, Project Management etc. For the sustainable development of safety, quality and environment management, SJVN will ensure compliance of the laid down parameters during the year 2014-15.